Orchids are a group of flowering perennial plants that are the second largest group of plants in existence. There is estimated to be anywhere from 25,000 to 30,000 species of orchids. With the exception of Antarctica, they are found growing in every continent of the world, usually in areas that are the farthest south. 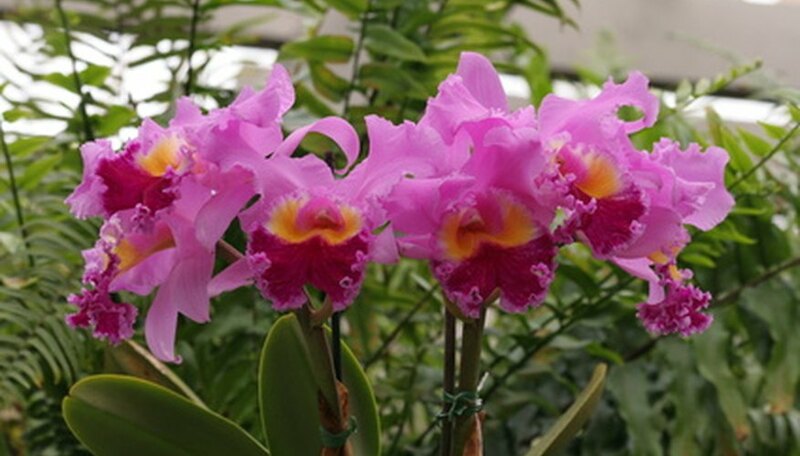 Contrary to popular belief, orchids are relatively easy to grow, requiring only minimal care once certain criteria are met. Purchase a soilless growing media for the orchids. You can buy a potting mix designed for orchids but do not use regular potting or planting mix. A good soilless mix will contain fir bark, tree-fern fibers, coconut fiber or chips, sphagnum peat moss, sifted perlite, osmunda fibers, granular charcoal, rockwool, redwood bark chips or expanded clay pellets as recommended by Orchid Mania. Position the wooden boxes about 12 to 36 inches from a light-filled window. Ideally, from a window that is facing southward, as recommended by the University of Illinois Extension. If you cannot provide such a location, you can also place the wooden boxes 6 inches away from two 24- to 36-inch wide light fixtures that are using two 40 watt florescent light bulbs. Scoop the growing media into each of the wooden boxes until each is about half full. If you are using your hands to scoop the media, wear latex gloves to prevent any spread of bacteria. Lay the pot containing the orchid horizontally on a table or potting bench. Use care not to break off any flowers or stems. Use a pair of multipurpose snips that have been sterilized (you can use alcohol or the flame from a lighter to do this) to cut down the sides of the pot carefully. Begin at the rim or drain-hole; continue around the perimeter of the pot until you can easily remove the orchid. Remove as much of the old growing media from around the orchid’s root system. Sever any broken, damaged or dried roots using the snips. Place the orchid on top of the soil in the wooden box. According to Orchid Mania you should plant an orchid so its crown will be sitting just slightly below the rim of planting pot, about 1/2 to 3/4 of an inch. Scoop in growing media around the orchid loosely to create an airy environment for the roots of the orchid. Do not firmly pack the media down around the orchid. Water the newly planted orchids to moisten the growing media until the water is coming out of the drain-holes. Place a shallow layer, about 1 inch, of decorative gravel into the bottom of a metal or plastic tray. The tray should be larger than the wooden planting box. Set the wooden planting box on top of the gravel. Pour water into the tray until the gravel is about half submerged in water. The evaporating water helps create a humid environment necessary for success in growing orchids. Provide orchids with daytime temperatures in the 70 degrees Fahrenheit range and no lower than between 55 and 65 F at night. Water the orchids about one time every week. Let the soil dry out slightly in between watering.